The B777-300 Cockpit Poster was drawn with a focus on both photo-realism and instructional value, allowing you to familiarize yourself with the B777-300 cockpit before ever stepping foot inside one! 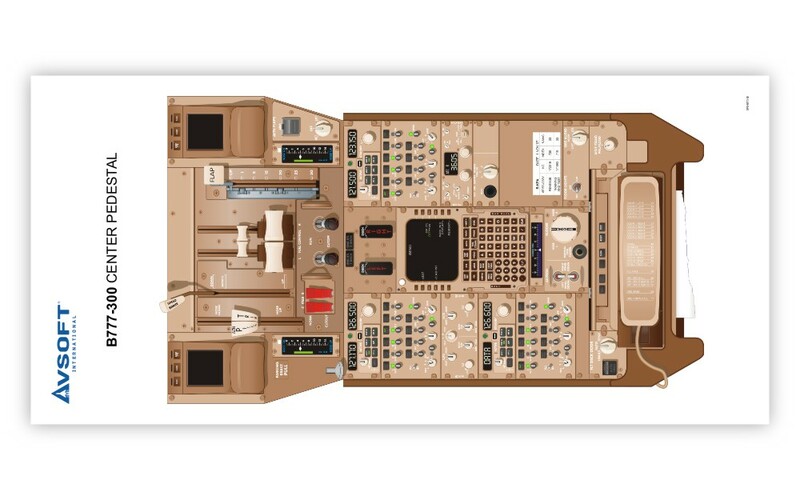 This cockpit training poster features full color vector illustrations drawn using photos and general measurements from a B777 cockpit, so that it provides an accurate representation of colors and dimensions, as well as a detailed portrayal of the individual controls and indicators. 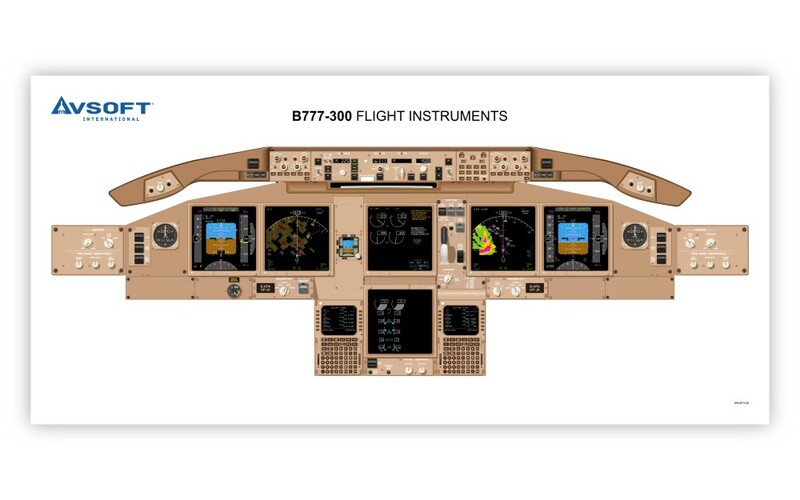 The Boeing B777-300 Cockpit Poster includes the flight instruments, the center pedestal, and the overhead panel. Designed for pilots transitioning to the B777-300, this poster provides excellent supplemental reference during ground school training, including the ability to practice cockpit flows. Each cockpit panel is printed on an individual sheet. Cockpit panels are not printed at the same scale, they are each sized to maximum print area on each sheet. Referred to as "standard" or "student" size, this is our most popular poster option. 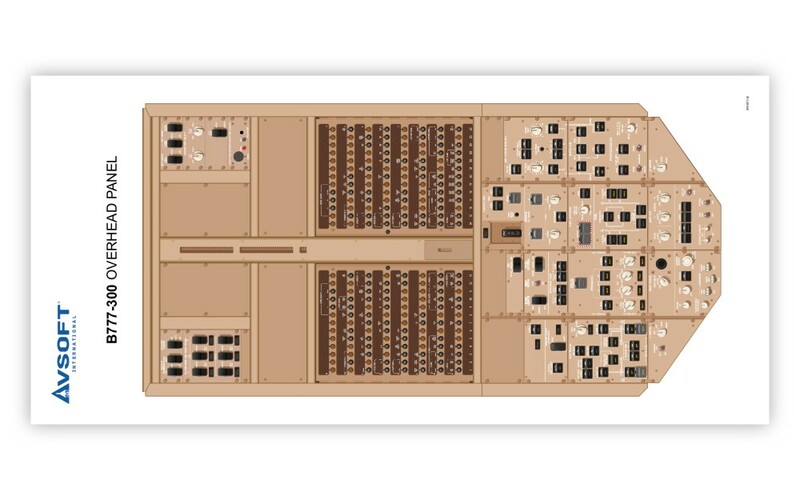 All cockpit panels are printed at same scale on a single sheet of paper. Each cockpit panel is printed at 100% scale/1:1 on an individual sheet of paper. These poster sets are designed for training purposes, not to be used as design templates. Avsoft’s cockpit posters can be branded with Airline and ATO company logos. In addition, Airlines and ATOs have the option of having Avsoft’s cockpit posters customized to match specific aircraft and simulator configurations. Boeing B737-800 with -600/700 Diffs.